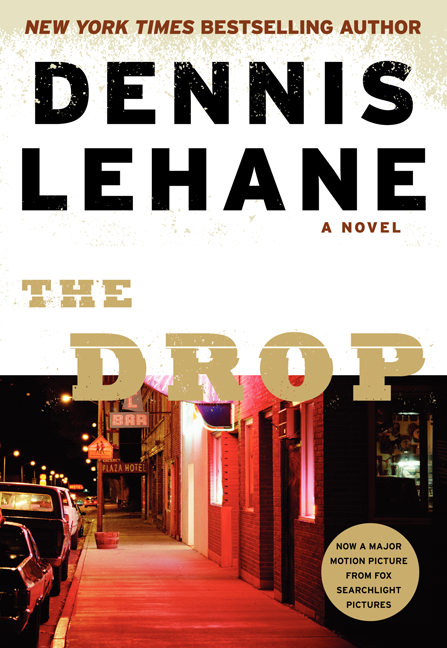 THE DROP is taut and violent crime novel adapted from the screenplay Dennis Lehane wrote for the film of the same name, scheduled for release later this year. This would usually be a turn-off; I’m rarely a fan of book-to-film adaptations, let alone film-to-book. But this is Dennis Lehane, my of the finest contemporary crime writers; and there’s more to the development of this novel than I’d initially thought; in an interview with the Boston Globe, Lehane indicated the screenplay was inspired by one of his short stories, “ANIMAL RESCUE,” which itself was based on a book he had started, then shelved, more than a decade ago. With that in mind, assured this wasn’t a cash-grab, I bunkered down into the world of THE DROP – and what a dark, bloody and violent place it is. The tagline for the novel is “a love story wrapped in a crime story wrapped in a journey of faith,” but I’m going to blunt that down and say this is a story about bad people living with the consequences of their choices; and in some cases, not living – but no spoilers here. The interconnected cast of characters in THE DROP includes a bartender, Bob, whose sullen and shy façade is not indicative of any sort of weakness, and whose discovery of an malnourished puppy is the spark that ignites the plot alongside the decision by two stick-up artists who intend on ripping off the Chechen Mafia; his cousin, Marv, who once ran the bar, back when he was a respected figure in the Boston underworld; a damaged woman, whose role is more integral than that of a mere love interest; a cop whose transgressions have stalled his career and left him in a bad place, personally and professionally; a crook named Eric Deeds; and ruthless Chechen Mafia enforcers. THE DROP clocks in at a little more than 200 pages; it’s tightly plotted and stripped of the clutter that often bogs down crime novels. At no point does it feel like a screenplay adorned with descriptions, nor a novel pared down for the sake of expediency; THE DROP is a fine crime novel in its own right, which so happens to be tied to a film release. It is a quick, impactful read; not as layered as Lehane’s other work, but a worthy addition to his library. As always, I recommend reading the book before seeing the film.